International Journal of Experimental Agriculture (IJEA) is an international, double-blind peer-reviewed; open-access journal published by the Green Global Foundation Journals (GGF Journals). The Journal is dedicated to the advancements in agriculture throughout the world. The goal of this journal is to provide a platform for scientists, students and academics all over the world to promote, share, and discuss various new issues and developments in different areas of agricultural sciences. 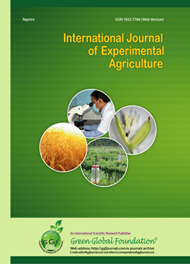 The journal publishes original papers including but not limited to the following fields: Agricultural Biodiversity; Agricultural Ecology; Agricultural Economics; Agri-chemistry; Agronomy; Agro-ecosystem analysis; Animal husbandry; Aquaculture; Crop botany; Crop Physiology and Science; Cropping system research; Dairy Farming; Entomology; Farming system research; Fertilization, Breeding and Protection of Plants; Horticulture; Irrigation Management; Modelling of Crop and Animal Systems; Organic Agriculture; Plant Breeding Genetics; Plant Nutrition; Plant pathology; Seed science and technology; Soil Science and Soil Land Use; Soil-Plant Relationships. All manuscripts must be prepared in English and are subject to a rigorous and fair peer-review process. The journal publishes six times in a year. Copyright © 2006-2016 Green Global Foundation. All rights reserved.